Students at Booker T. Washington Middle School in Newport News could tell something was “fishy” when Jami Ivory entered their afternoon Life Science class last week. 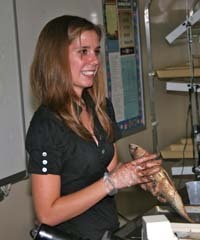 Ivory—a graduate student at the Virginia Institute of Marine Science—is a fellow in the PERFECT/GK12 program at VIMS. The program—now in its 5th year—pairs graduate students with K-12 teachers allowing them to mentor and learn from each other. Ivory is paired with Tim Jones—a 7th-grade science teacher at B.T. Washington. Jones and Ivory decided to make a recent class more engaging by dissecting a mackerel in an effort to bring fish anatomy out of a textbook and into the real world. During the dissection, students flocked to the front of the room to pay close attention as Ivory delicately removed pieces of the mackerel’s bones, an eyeball, its liver, and part of its gills. “Wow, that is absolutely amazing,” said one of the students as Jones passed around the fish’s parts so his students could get a closer look. The PERFECT program, or Partnership between Educators and Researchers for Enhancing Classroom Teaching, is funded by the National Science Foundation’s GK-12 program, which supports fellowships and training for graduate students in science, technology, engineering, and mathematics (STEM) through interactions with teachers and students. Ivory's fish dissection is just one example of the types of hands-on activities that GK-12 fellows bring to their partner schools. Other fellows have worked with students to build remotely operated submarines, conduct a scavenger hunt for "biomarkers," create and map impact craters using rubber balls and flour, and use simple genetic tests to study the tissues of marine organisms. The PERFECT/GK12 program was started by VIMS professors Kam Tang and Iris Anderson, along with Virginia Sea Grant educators Vicki Clark and Carol Hopper-Brill. Clark and Hopper-Brill also co-manage the program. Ivory says she wanted to get involved in the program because it’s an opportunity for her to improve her communication skills so that she can help the public understand and relate to her research, but also to have a positive effect on the students. The fellows also benefit from their teacher’s experience and expertise in adapting science to current curriculum standards, presenting scientific concepts to young minds, and managing a classroom. Since its inception in 2009, VIMS’ PERFECT/GK12 program has supported 47 fellows who have taught approximately 5,500 students. With each fellow spending 280 hours per year in the classroom, that comes to 13,100 hours invested in enriching STEM education and developing the fellows’ communication skills. VIMS students work in five different schools that serve a high percentage of students traditionally underrepresented in STEM. This year’s other GK-12 fellows are Allison Colden and Wes Hudson (Chesapeake Bay Governor’s School-Glenns Campus); Lela Schlenker and Alison Deary (York High School); Brendan Turley and Annie Murphy (Grafton High School); Britt Dean (B.T. Washington Middle School); and Cassie Glaspie, Pattie O’Leary, and Katie May Laumann (Peasley Middle School).